This is my favorite Homemade Macaroni Salad recipe! 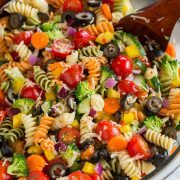 It’s a classic pasta salad dish — nothing super fancy, it’s just that delicious comfort food you remember growing up with and eating in the summertime. It’s tossed with colorful veggies and covered in a rich and creamy dressing. Macaroni salad is one of those things that I haven’t always appreciated. I would always walk right past pasta salads and potato salads and now I absolutely love both of them! 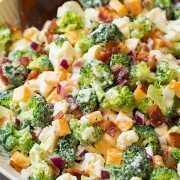 They are perfect for parties/potlucks, picnics, and of course they are a wonderful side dish for lunch or dinner. 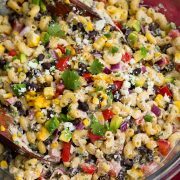 I love pairing this easy macaroni salad with the classic summertime favorites like bbq chicken or pulled pork and corn on the cob, and oh yes, and let’s not forget the watermelon. I have the feeling it might just be the first thing to go at your next cookout. Just look at all the goodness in this salad! Chances are it will become a new favorite! Want to see how easy this macaroni salad recipe is? Watch the video! Cook macaroni in salted water according to directions on package. Drain and rinse with cold water until completely cool. Let drain very well. In a medium mixing bowl stir together mayonnaise, Greek yogurt, vinegar, mustard, honey, and season with salt and pepper to taste. Add well drained macaroni to a large mixing bowl along with eggs, bell pepper, carrots, celery and onion. Pour dressing over top, add in parsley and toss mixture to evenly coat. Serve or store in refrigerator up to 1 day. I love this homemade macaroni salad recipe, and that you can make it your own! (I’ve made it a little healthier by subbing out half the mayonnaise with Greek yogurt). Can This Macaroni Salad be Made in Advance? 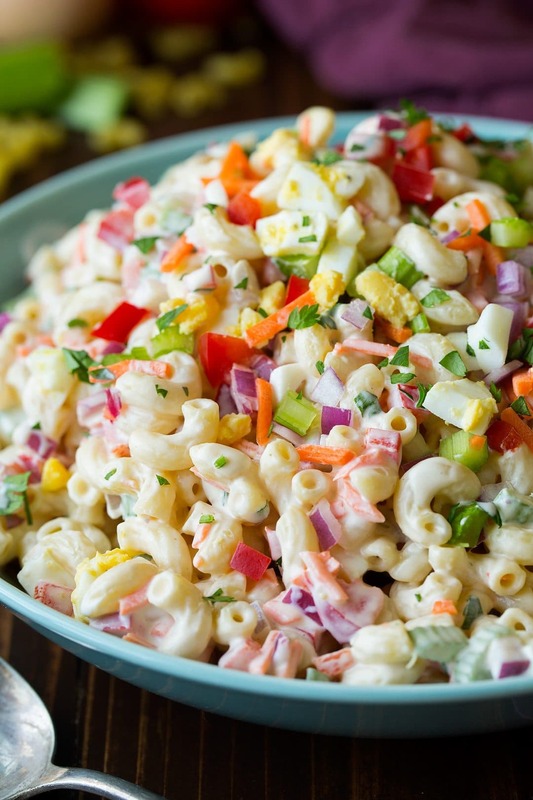 Yes, this classic macaroni salad is great for making the night before a potluck or picnic. Because this is a pasta salad with mayo and yogurt in the dressing, making it ahead of time gives the macaroni time to soak up all that flavor. 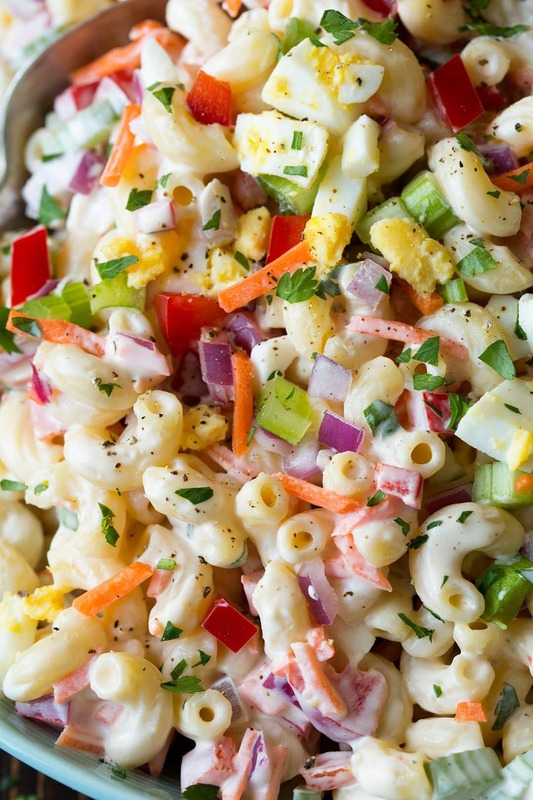 You can store this homemade macaroni salad in the fridge for up to a day before serving it. Don’t worry, this macaroni salad won’t taste sweet at all. The honey helps offset the tanginess of the vinegar, yogurt, and mustard. Use fresh parsley to brighten up this salad. Dried parsley won’t work in this recipe! If you don’t have Dijon on hand, feel free to use a different type of mustard instead. Another type of short, sturdy pasta can be used in place of elbow pasta, if needed. 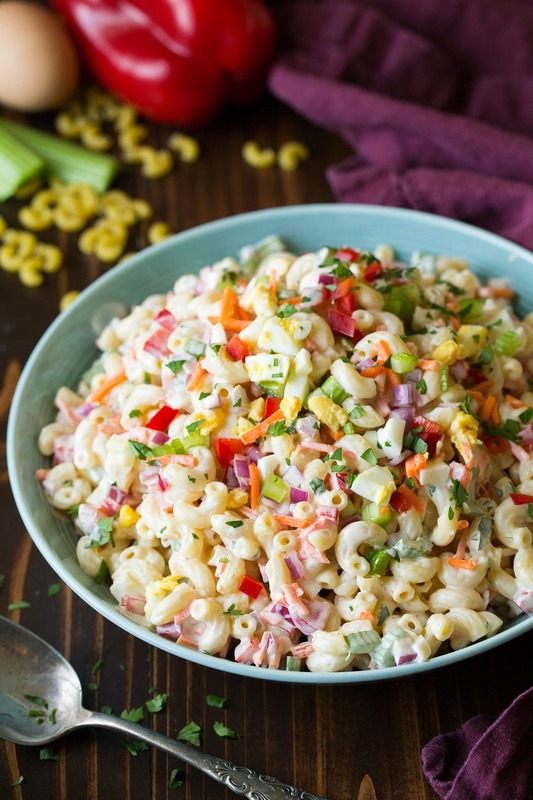 The best summertime macaroni salad! Just like what you remember eating as a kid but here it's made a little healthier with Greek yogurt in the dressing. It's layered with colorful veggies and sure to satisfy! Cook macaroni in salted water according to directions on package (I added about 1/2 tbsp salt to the water). In a medium mixing bowl stir together mayonnaise, Greek yogurt, vinegar, mustard, honey, and season with salt and pepper to taste (start with about 1/2 tsp salt and 1/4 tsp pepper then add more salt after you've added the dressing to the pasta). 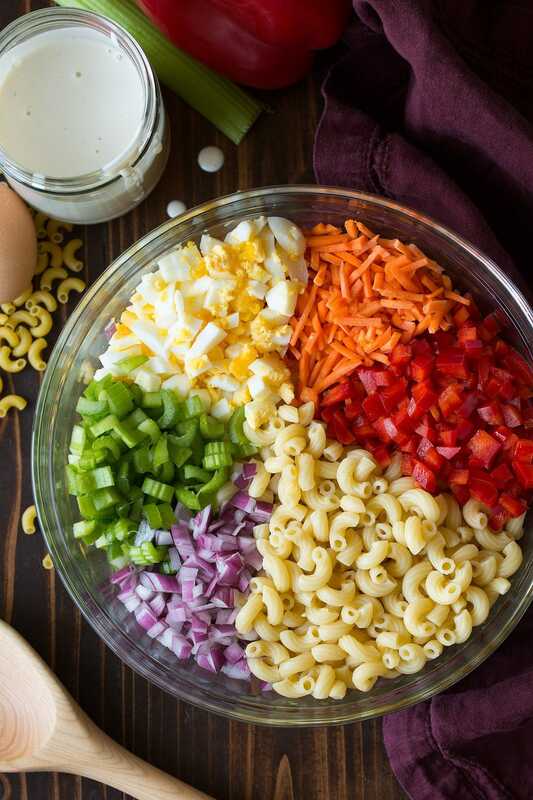 Add well drained macaroni to a large mixing bowl along with eggs, bell pepper, carrots, celery and onion (if you like to have some color over you salad I like set aside some of the veggies to sprinkle over the top). Use fresh parsley to brighten up this salad. Dried parsley won't work in this recipe! If you don't have Dijon on hand, feel free to use a different type of mustard instead. This post is sponsored by Mirum Shopper, however all thoughts and opinions are my own.